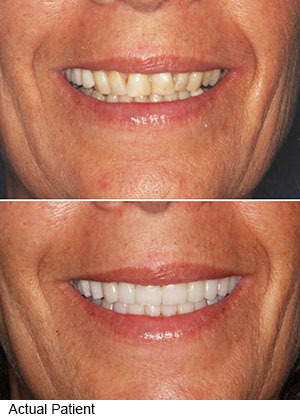 Porcelain crowns can also be part of a complete smile makeover. Crowns can not only help you achieve a more natural looking smile, they are safe and non-allergenic, too. A porcelain crown provides natural looking solution for your dental problems. Unlike traditional crowns, they will not leave a dark line around your gums. Your porcelain crowns will look and feel like part of your natural smile, only better. Because your porcelain crown is custom made to fit your smile, it will match the size, shape and color of your natural teeth. The strong porcelain material is resistant to stains. With proper care a porcelain crown can last a lifetime. You will care for your porcelain crowns just like you do your regular teeth with daily brushing and flossing and regular dental checkups. fail to bond to the tooth’s surface. We use porcelain or all-resin crowns that match your natural tooth color and blend in nicely with surrounding teeth. There is no metal in porcelain or all-resin crowns,thus taking a metal allergy and the dangers of metal out of the equation. Placing your dental crowns is a two-step process. During the first visit, we will take a mold of your teeth to use for the custom creation of your permanent crown. We will fit you with a temporary crown until your next visit. On the second visit, your custom made porcelain crown will be permanently adhered to your natural teeth. Dr. Satvat strives to find the best dental solutions for her patients to provide them with a better quality of life.